In this age of super cool technology and cinematic special effects galore, it’s hard to determine what is real and what isn’t when viewing a video or photo. Action movies wouldn’t be so explosive and life-like nor would horror movies haunt your dreams if special effects hadn’t developed to the point where they are today. Yes, the Photoshop experts and CGI professionals have several tricks up their sleeves and are good at what they do; however, the greatest artist in the world leaves them all in the dust. This phenomenal artist is our very own Mother Nature. Unlike the effects produced with computers, these natural pieces are not fake; they are all too real. So, Hollywood, keep your special effects – we don’t need them when it comes to our big green planet! These natural phenomenon are incredible and while it may be hard to believe … they truly exist in our world. Check out some of these natural phenomenon below and prepared to be amazed by nature. Volcanoes don’t leave lightning just to the thunderstorms, they cause their own! Scientists suspect, like thunderstorm lightning, that volcanic lightning occurs as a result of charge separation. The ejecting material from the volcano carries a positive charge into the sky and lightning is the result of these charges being balanced in the atmosphere. Lake Abraham in Alberta, Canada offers quite an interesting site: frozen bubbles! Queen Elsa isn’t the culprit here; it is little bacteria in the water under the ice. These bacteria digest organic material and release methane bubbles that rise to the frozen surface. When the methane contacts the icy water, the bubble freezes into this beautiful natural phenomena. Just don’t pop them because this will happen! These funky looking cliffs are the real deal. Giant’s Causeway, located in Ireland, consists of approximately 40,000 interlocking basalt columns. This natural scene is a result of an ancient volcanic eruption. These columns are so popular that they are the top tourist attraction in Ireland! No, you’re not upside down and looking at oceanic waves – you’re looking at clouds in the sky! These special clouds occur when enough rising air is present to create widespread cloud cover. When this combines with wind shear and turbulence, the resulting sky looks like a wavy ocean cloud (aka undulastus asperatus clouds). According to the World Meteorological Organization, this cloud formation is not yet officially classified as a type of cloud, but it is being examined as a possibility. Here’s a spooky sight – animals that have turned into stone! Just kidding – that isn’t true, but this phenomenon is still an interesting one. Some lakes, such as Lake Natron in Africa, have such a high alkalinity that they can have a pH as high as 10.5 (out of 14). Sodium carbonate and other minerals that flow into the water from surrounding hills cause this high alkalinity. Water this basic can be deadly to some animals that come into contact with it. Unlucky animals, such as this eagle below, who have taken a dip in the lake have become calcified by the harsh waters. This causes their bodies to appear as if they mysteriously turned into stone! This lake is not all doom and gloom though – the Lesser Flamingo loves this prime spot during breeding season. Journey to Maldives to see glowing waves! Yes – glowing. 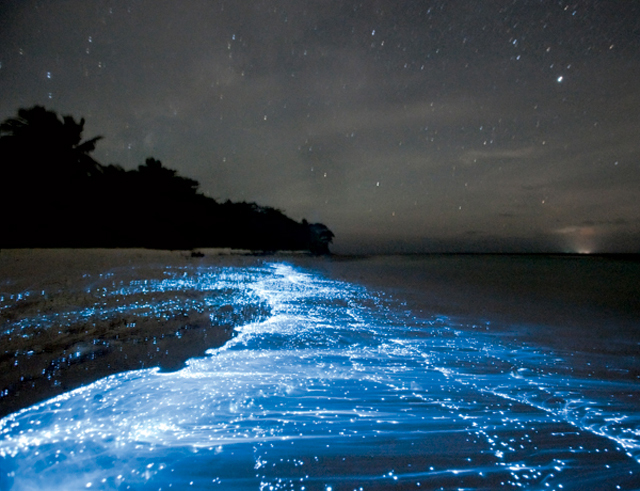 Little marine microbes named phytoplankton are responsible for producing this bioluminescence. Pretty cool huh? 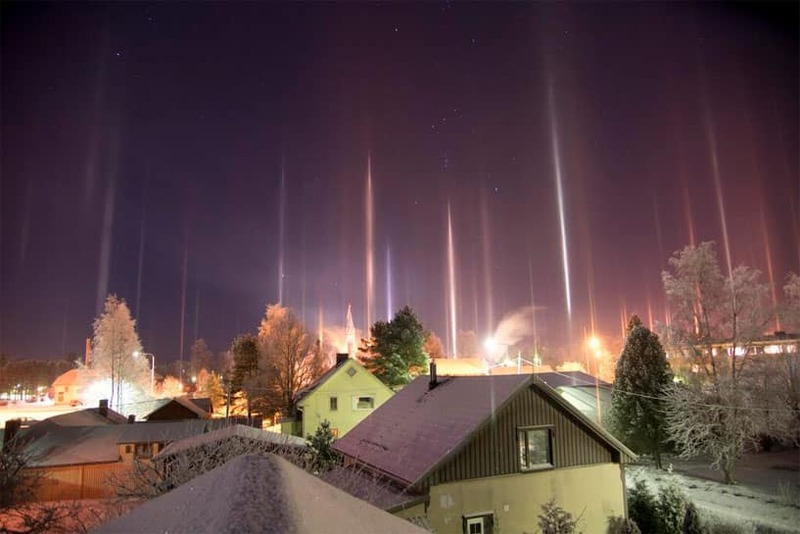 It’s not an alien abduction you’re looking at – they are light pillars. When plate shaped ice crystals form in clouds, light reflects, and it appears as if there is a pillar in the sky. The light source can either be the sun or moon; however, these light phenomena are usually seen in cold, arctic regions. Dress warmly when searching for these cool sky lights. This rainbow tree actually exists! The Rainbow Eucalyptus tree has bark that peels off at different times of the year, and the inner bark beneath shows a vibrant color. The different colors occur as the bark matures. Gorgeous. No way are those natural – they are too perfectly spherical! 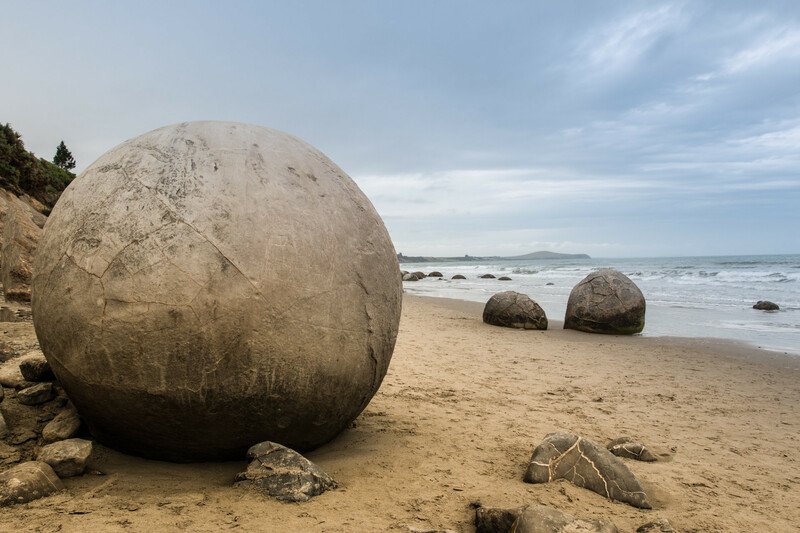 However, once again, these New Zealand boulders are all too real. They were formed from ancient sea sediments, and as the shoreline eroded, they became the exposed spheres we see today. Chile possesses some funky looking rocks – oh wait, it’s a living organism. We promise these creatures are not the creation of special effects. Scientifically, this organism is called Pyura chilensis, but it’s more fun to call them living rocks. This scene isn’t out of some horror movie – it’s just nature doing its thing. When intense flooding occurred in Australia, ground-dwelling spiders fled their subterranean homes and covered this country side in webs. Don’t go to Wagga Wagga, Australia if you’re arachnophobic and it happens to be the rainy season because there is chance this phenomenon could happen. Green Monsters, do you have other natural phenomenon missed in this list? Have you seen any of these phenomenon in person? Share other phenomena or your experiences with the ones in this list in the comments below with other Green Monsters.